Carpool to SLO Half Marathon to Cheer on Your Favorite Athlete! The events module at iRideshare.org allows you to meet up for shared rides. 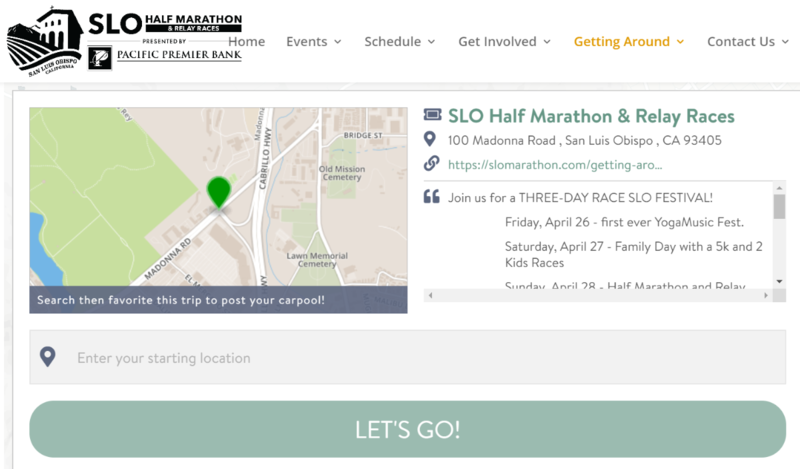 Set up your SLO Half Marathon or Earth Day Festival carpool now. iRideshare.org has a nifty tool that lets you share a ride to your favorite events, like the Mid-State Fair, SLO Half Marathon, and SLO's Earth Day Festival. Why struggle to find parking when we can get there together? Looking for bus or bike options instead?? You'll find those too! We also use this tool to plan Bike to Work Day group rides. See if your neighbors or workplace have a ride, or post your own now! RTA Bus Commuters - Your Phone is Now Your Bus Pass! Skip the pass outlets and use the Token Transit app to purchase day, month and region passes on your phone. You can now use the Token Transit app for both SLO Transit and SLO RTA routes (including SCT and Paso Express). Simply link a credit card, purchase the token of choice, and flash your pass when you board! Coming soon: you'll soon be able scan your pass and have your bus trips logged automatically when you link your account to iRideshare.org to claim rewards. For now, give a digital pass a try! Win a $1,500 Folding Electric Bike! 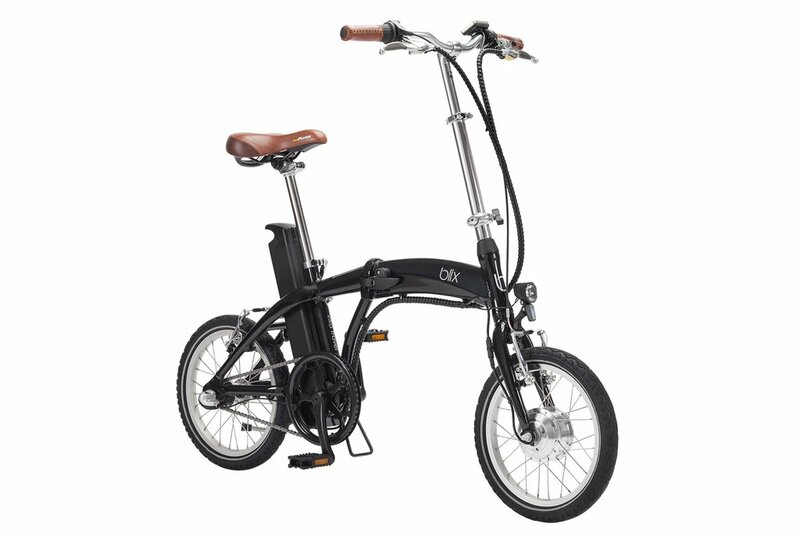 Win this blix folding electric bike by entering the sweepstakes at your closest Bike to Work Day Station on May 17th. Whether biking 30 miles to work, going by bus and bike, or just biking around the block, scan the QR code or enter the URL provided at your favorite Bike to Work Day station on May 17th for your chance to win! There are 11 Bike to Work Day Breakfast Stations (7-9 AM) and 4 "Happy Hour" Stations (4-6 PM). Our region's Green Business Network invites you to go the distance and consider reusable utensils, cups and containers for these events! 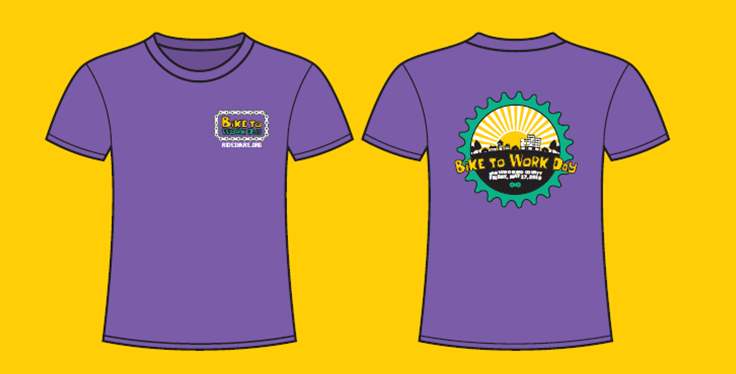 Make a $10 pledge and get a 2019 Bike to Work Day t-shirt! Want to order in-bulk for your employees who bike to work on May 17th? Let us know. 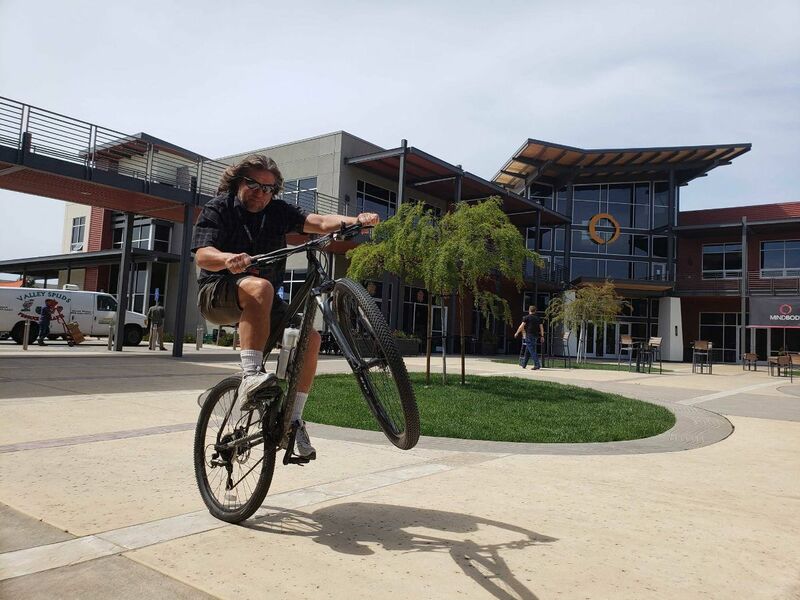 On April 20th, Bike SLO County will teach you all the skills you need to feel confident on or around bikes. Join Bike SLO County at 867 Pacific Street on Saturday, April 20th from 11-3 PM to learn the rules of the road, tips for predictable riding, how to navigate popular roadways, and get some on-the-road experience. Whether you have never biked, dabbled, or are pretty confident, this workshop offers something for everyone just in time for Bike to Work Day! Cost is $5 and includes pizza. Log Your Commutes for March & Enter April Sweepstakes Now! Today is the last day to log March smart commutes. Visit iRideshare.org today and enter the "March Into a Smarter Commute" sweepstakes for your chance to win a $100 gift card. "I started logging trips in iRideshare.org on May 1st 2013. So that’s 5 Years, 10 Months, 21 Days, 13 Hours, 28 Minutes and 2 seconds from typing this. The entire process of exercising, fresh air, and excellent parking make biking the smartest choice. I love having the wind in my whiskers. I do a wheelie every morning going up the Los Osos Valley Road bridge which always makes me smile. I'll see everyone out there for Bike to Work Day on May 17th!" Join Todd and thousands of other commuters by logging trips and entering to win the April $100 grand prize. We Need Help Counting Bikes! SLOCOG needs your help counting bikes the week of May 13th-18th. Attention partners, community advocates, and Safe Routes to School champions: your help is needed at key locations in the region to gather bike and pedestrian volume data as part of set count days. The More You Know... Does your commute choice match your astrological sign? It may sound trivial, but people follow their astrological signs to determine the right love interest, why not see how your sign aligns with your smart commute choice? Copyright © 2019 Rideshare, All rights reserved.